We know it’s not just the person with aphasia who needs support – families need groups, too. 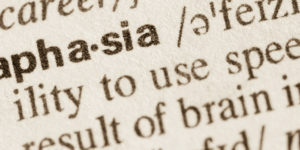 The success of a person with aphasia depends on social support and social connections. So it is very important to provide information, resources and help to family members and others on whom the person with aphasia depends. Is your family member in the hospital or rehab now or recently diagnosed with aphasia? Are you feeling overwhelmed and unsure of what to do? Whether you have been touched by aphasia for a long time or new to aphasia, Voices of Hope for Aphasia provides support and education for family and friends. 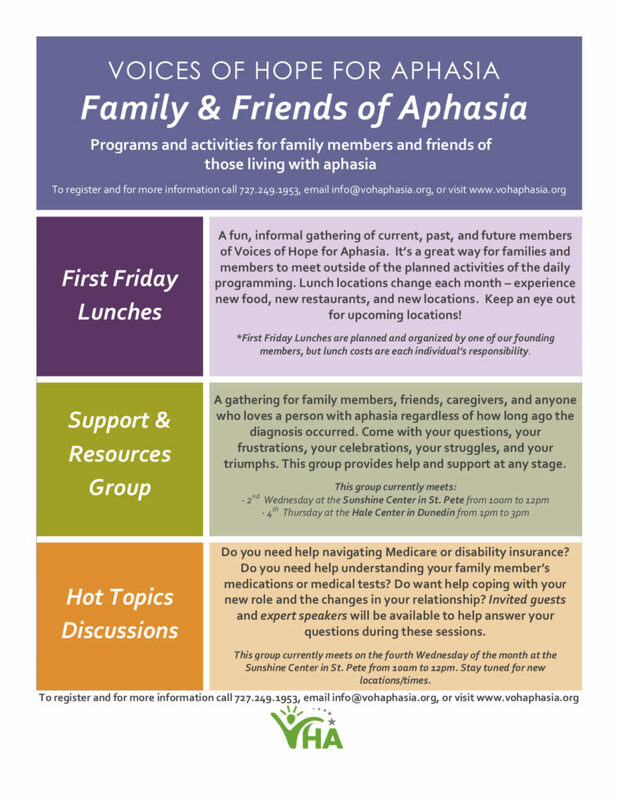 Our Family & Friends of Aphasia program offers social, supportive, and informative opportunities: First Friday Lunch Outings, Support & Resources Group, and Hot Topics Discussions. Click here to download this flyer. Click here for the upcoming schedule of “Hot Topics” and guest speakers. June 2019: Dr. Jim Chinarian – What are the best approaches to rehab: acute and beyond? The programs are offered at no charge, but please register in advance. (Donations are always appreciated!) Call 727.249.1953 or email us at info@vohaphasia.org for registration details. Voices of Hope for Aphasia is a 501(c)3 nonprofit organization. Donations are appreciated and go directly to support of all of our programs.